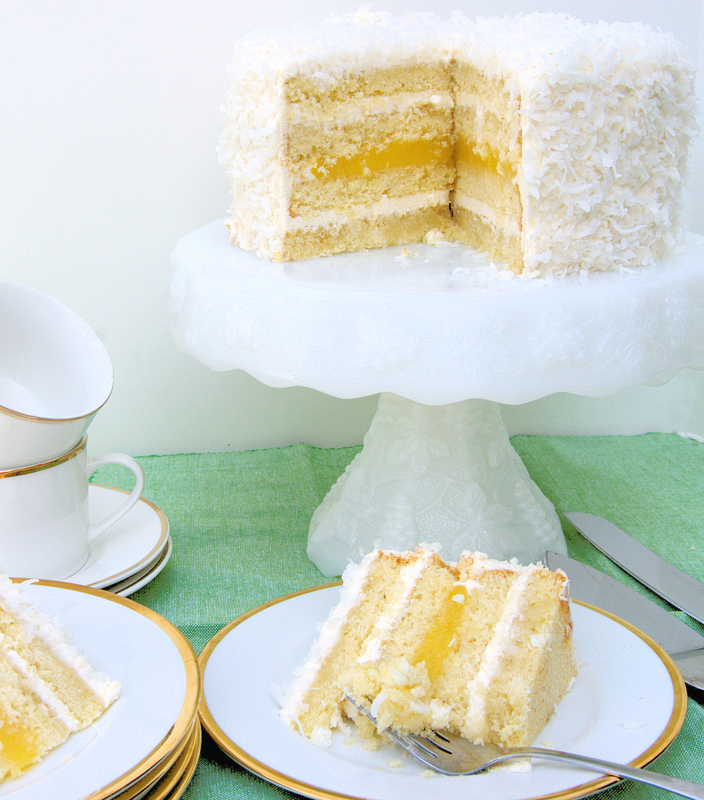 This Coconut Passion Fruit Cake really is dreamy. Is there anything prettier than a coconut cake? Tall and snow white, sprinkled with shredded coconut, it looks just as scrumptious as it is. This cake gets even prettier when you cut a slice and see the beautiful bright-yellow layer of passion fruit curd in the middle. Creating new cake flavors is probably my favorite thing to do as a professional baker. I love tinkering with the ingredients and amounts to create a whole new cake flavor. From a few basic recipes and concepts the possibilities are endless. 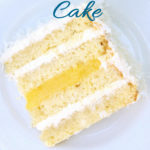 Coconut cake is an old fashioned and favorite cake flavor. But here I’ve updated an old favorite with an extra layer of tropical flavor. I added a layer of tangy passion fruit curd in the middle of the cake. But first we need lots of coconut flavor and there are plenty of ways to get coconut flavor into the cake. 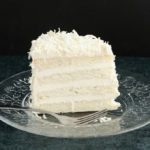 I love the texture and beauty of the shredded coconut on the outside of a coconut cake, but I don’t like to put shredded coconut into the filling or bake it into the cake. I’ve found that coconut inside the cake makes it hard to cut neat slices. 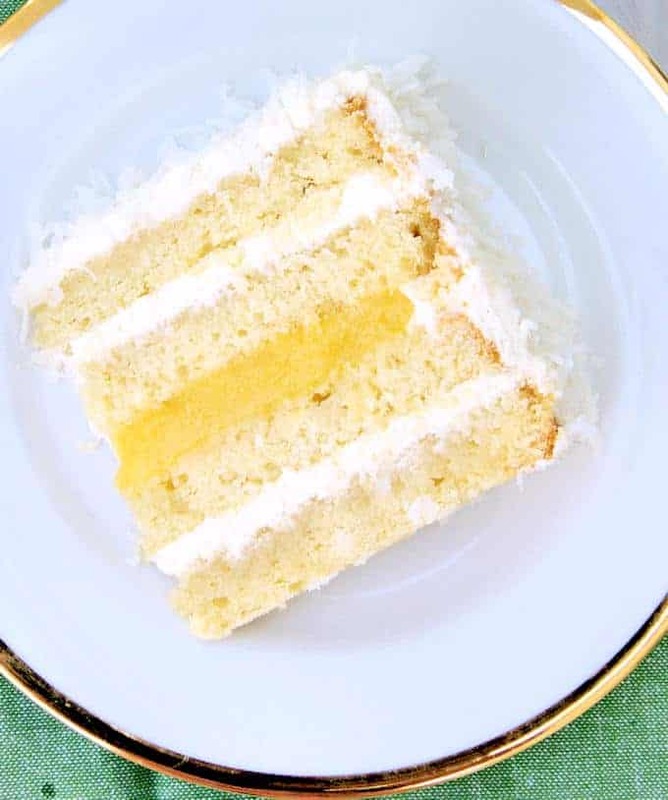 The bits of coconut tend to catch onto the knife and shred the cake. I use coconut milk in the rum syrup and in the cream cheese frosting. 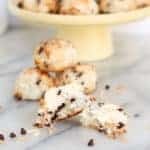 The milk adds plenty of coconut flavor without compromising the texture of the tender cake crumb. 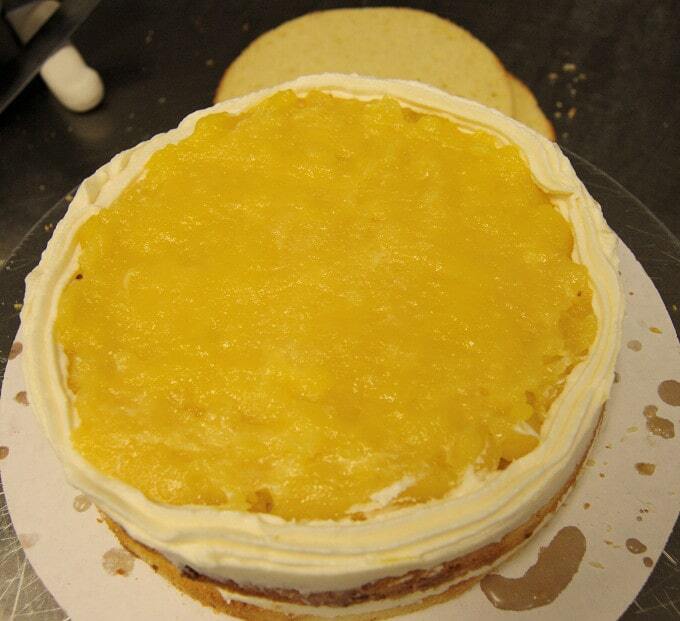 To keep the passion fruit curd from oozing out of the cake, pipe a “dam” of the icing around the rim of the layer. You can use this trick with any soft cake filling. I use my vanilla butter cake as the base for this cake. I prefer thinner layers of cake and frosting so I split the 2 cakes to make a 4 layer cake. I always trim off the browned edges because I don’t like the way they look and the crust on the cake can get gummy under the icing. I also cut off the domed top of the cake. If the brown edges and domed top don’t bother you go ahead and skip trimming the cake. You could certainly toast the coconut for the finish if you prefer the look and flavor of toasted coconut. I prefer to leave it snow white. 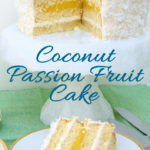 Passion Fruit Curd is a nice foil for the rich cake and frosting, and of course the tropical flavor is perfect for this cake. Pipe an icing “dam” around the rim of the cake to keep curd filling from leaking out of the cake. Spread the curd to the edge of the “dam” then add the next layer. You could also make filled cupcakes from this same recipe. Bake the vanilla cake in a cupcake pan. Use the tip of a small serrated knife to cut a small hole (about 1″ around) in the middle of each cupcake. 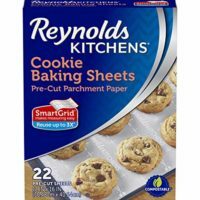 Don’t cut all the way through to the cupcake paper. 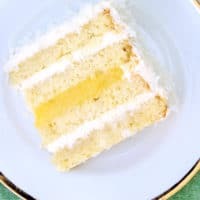 Sprinkle a little of the coconut syrup into the hole, fill the hole with passion fruit curd and top the cupcake with the coconut cream cheese frosting. Sprinkle with coconut. If you love this recipe as much as I do, please consider giving it a 5-star review. 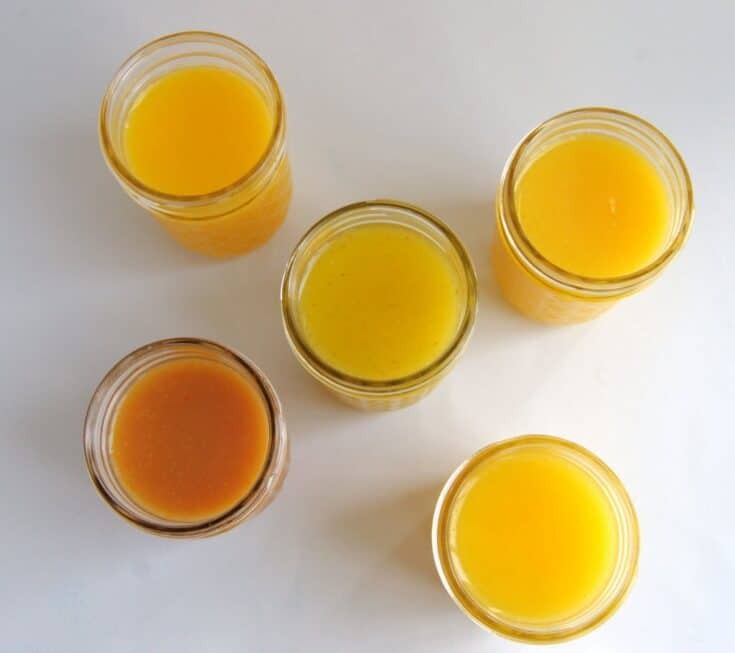 Lemon curd is just the beginning. Fruit curds can be made with citrus fruit, mango, passion fruit, and others. Easy to make and so versatile in the kitchen. If you are using the gelatin, bloom in 2 tablespoons cold water in a medium size bowl. Set aside. 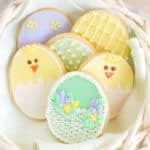 Thoroughly whisk together the sugar and eggs in a medium saucepan. Add the lemon juice, zest and salt. Place the butter on top of the bloomed gelatin. Put a fine mesh sieve over the bowl and keep it near the stove. Heat the egg/juice mixture over medium low heat, stirring constantly. You must be sure to keep stirring across the entire bottom and corners of the pot so the custard does not have a chance to stick. The mixture will start out opaque with a fine white foam over the surface. As it heats up the curd will thicken, become more translucent and the foam will disappear. Cook until the curd will coat the back of a wooden spoon and is almost to a boil (about 195°F).Don't allow it to come to a full boil. Immediately remove from the heat and pour through the sieve over the butter and (optional) gelatin. You can skip straining the curd if you like the bits of zest in the curd. Sometimes I leave it in if I want the color. Stir until the butter and gelatin are melted and thoroughly incorporated. Cover the bowl with plastic wrap and cool a bit before putting in the refrigerator. Refrigerate until completely cooled. If using gelatin, allow it to sit 8 hours or overnight to gel. The curd will keep for a couple of weeks in the refrigerator and can be frozen for several months. If you're using the curd to fill a tart or cake the gelatin will help it keep it's shape as it's cut. If you're using it as an ice-cream topping or as a spread you can leave the gelatin out. 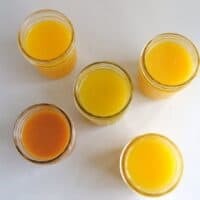 This same recipe can be made with any fruit juice. The amount of sugar can be adjusted according to how sweet the fruit is. 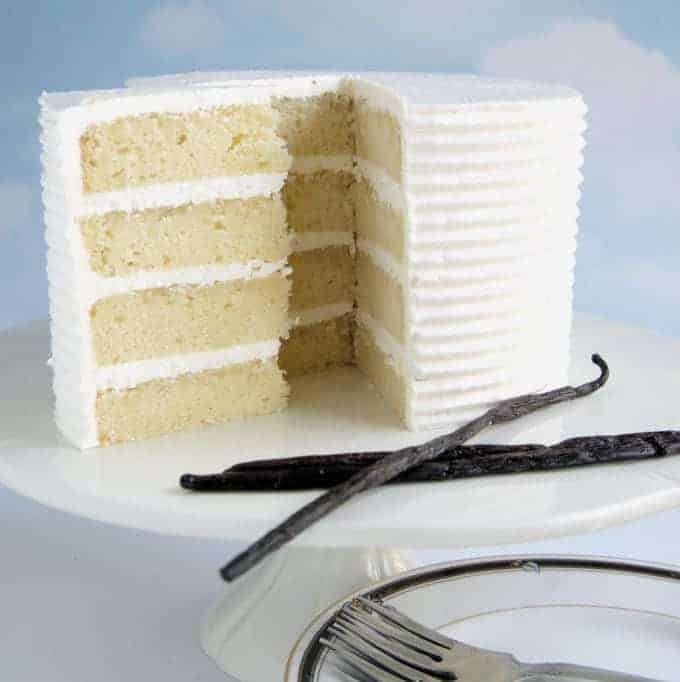 Perfectly tender and buttery vanilla cake layers. Super soft, yet strong enough for sculpted or wedding cakes. Preheat the oven to 350°F. 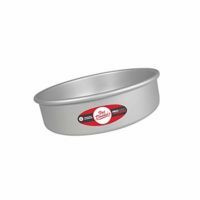 Line two 8" round cake pans with a circle of parchment paper or butter and flour the bottom of the pans only, not the sides. 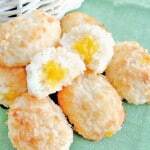 Combine the yolks, 1/2 the sour cream and the vanilla in a small bowl, whisk to combine, set aside. Into a mixer bowl put 1 1/4 cups of the sugar, sift in the flour, leavening and salt. Mix on low speed for 10 seconds to distribute the leavening. Add the butter to the flour mixture. Mix on low until the butter is incorporated and the batter looks like a paste. Add the other 1/2 of the sour cream to the flour and butter mixture. Increase the speed to medium and mix about 3 minutes until the batter lightens in texture. 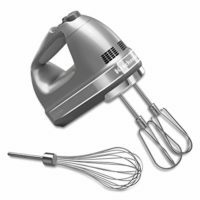 If you're using a hand mixer add another minute or two to the total time. Scrape the sides and bottom of the bowl. With the mixer on low, add 1/2 the egg yolk mixture. Mix until mostly incorporated. Scrape the sides and bottom of the bowl. Add the rest of the egg yolk mixture. Scrape the bowl and mix until incorporated. In another bowl, whip the egg whites on medium high until they form soft peaks. Turn the mixer to medium low and slowly add the remaining 1/4 cup of sugar. Turn the mixer to medium high and whip the whites to full peak. Fold the whites into the base in 2 parts, folding just until there are no streaks of egg whites. Divide the batter between the 2 pans and spread so it's level. 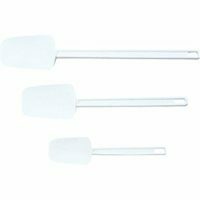 Bake until the center of the cake springs back when lightly pressed or a toothpick inserted into the middle of the cake comes out clean, about 25-30 minutes. Cool 10 minutes in the pan and then turn out onto a cooling rack. 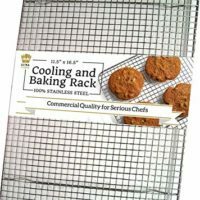 When fully cooled, wrap in plastic and refrigerate at least 3 hours or overnight before filling and assembling the cake. The cake is very soft the day that it's baked. If you'd like to trim the crust and split the layers allow it to chill in the refrigerator until it's firm enough to handle without breaking. 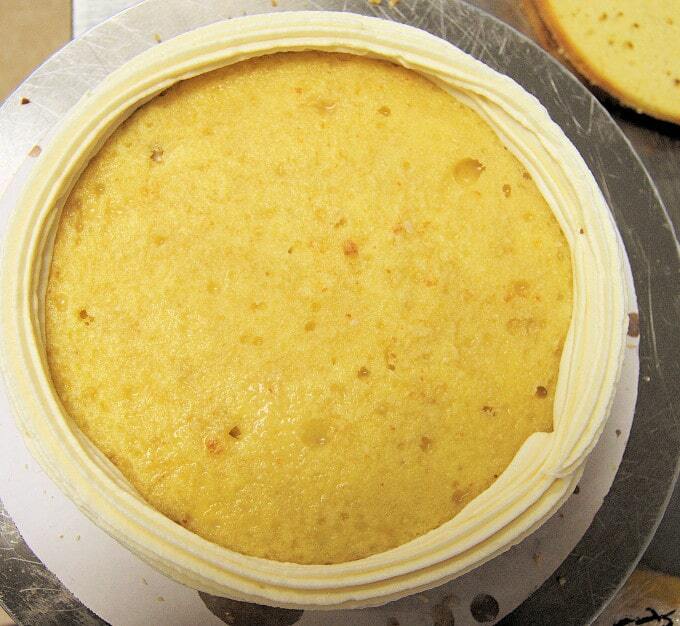 The filled cake can be kept at room temperature for several days (unless it has a perishable filling). The cake cake be frozen for several months. Tall and snow white, sprinkled with shredded coconut, it looks just as scrumptious as it is. This cake gets even prettier when you cut a slice and see the beautiful bright yellow layer of passion fruit curd in the middle. Trim the browned edges from each cake and slice off the domed top. Split each cake in half horizontally so you have 4 layers. 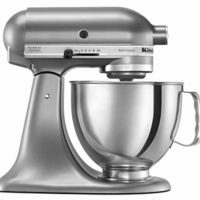 In a mixer bowl, cream together the butter and the confectioner's sugar until there are no lumps of butter and the mixture lightens a bit. Scrape down the beater and the sides and bottom of the bowl. Still using the beater, add the softened cream cheese and mix until combined. Scrape down the paddle and bowl. 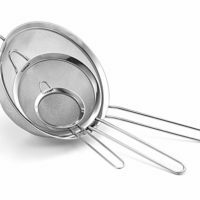 Switch to the whisk attachment. Add the vanilla and coconut milk and whisk until the frosting is light and fluffy. 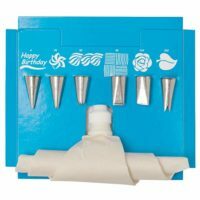 Use immediately to fill and ice the cake. 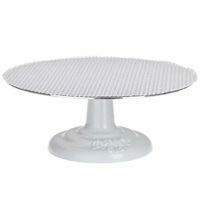 Place a dab of frosting your serving plate to hold the cake in place. Set a layer onto the serving plate and generously brush the entire layer with coconut rum syrup. Spread about 1 cup of the coconut cream cheese frosting evenly on the layer. Place the 2nd layer on the cake and brush generously with the syrup. Using a pastry bag with a star tip, pipe a "dam" of frosting around the edge of the layer. Spread the passion fruit curd inside the dam of frosting. Place the 3rd layer on the cake and brush generously with the syrup. Spread about 1 cup of the coconut cream cheese frosting evenly on the layer. Place the top layer on the cake and brush generously with the syrup. 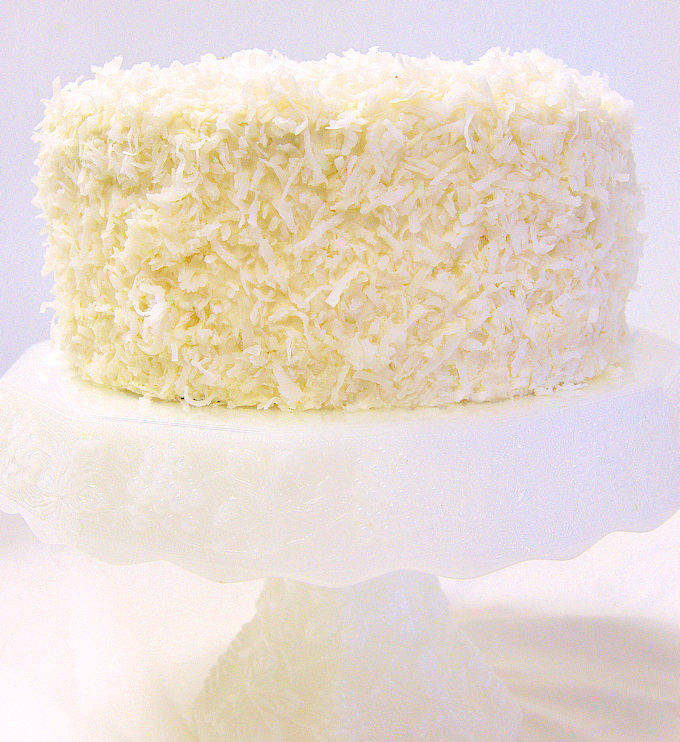 Ice the cake with the remaining frosting and cover the entire cake with the shredded coconut. 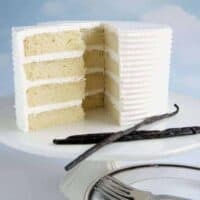 The cake is best eaten at room temperature. Any uneaten leftovers should be refrigerated. Return to room temperature before serving. Watch this video to see how to build a layer cake. Watch this video to see how to ice a cake. Coconut AND passion fruit? Yes, please! This cake looks great. Would it pair nicely with your Italian buttercream rather than cream cheese frosting? I’m not wanting the cake to have a rich taste that sometimes does with cream cheese frosting? Sure, I’ve made with with IMB many times. I like it with rum flavored buttercream. Great thanks. How many people would this size cake feed? i need to make it for around 25 people so would i just double the ingredients? An 8″ cake should serve about 12-16 (depending how big you cut the slices). Since this cake is fairly tall, the slices don’t need to be super thick. You could double the recipe. Would you just bake it twice or do you have 4 pans or larger pans? 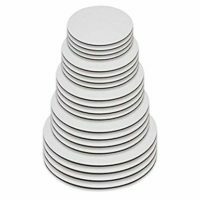 I was thinking of using a larger pan and just cutting thinner slices, as some of the people are kids anyway. Would that work? What size pan do you have? Hmmm, 2x the recipe would probably be too much for those pans. If you double the recipe I suggest filling the pans 2/3 full and using any extra batter to make cupcakes. Do you this could be altered into a German chocolate cake? Well, I would use my Chocolate Butter Cake or Old Fasionhed Chocolate Cake as the base for a German chocolate cake. The filling for German Chocolate Cake has coconut and pecans, evaporated milk, sugar and eggs. You could use the filling for this cake and add pecans and shredded coconut, but it is a different type of filling than the traditional German Chocolate Cake. Thanks for the question. I’ll German Chocolate Cake on my list of future posts.